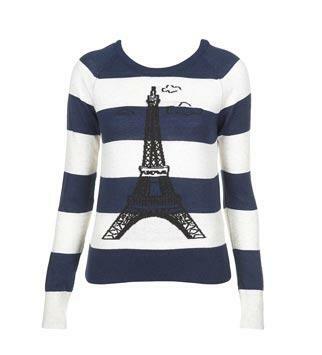 I've often (quite rightly) been accused of being a Francophile, but whatever; j'adore ce pull rayé de Topshop featuring a cute Eiffel Tower motif on classic navy and white stripes, in 100% cotton. It would look great with black jeans and patent black boots - j'adore clashing navy blue and black! Lots of girls in the InStyle office have it, but who cares about originality when it's this bargainous?